What is the Best Claw Hammer on the Market? Hammering was probably one of the first tool movements made with the human hand; more than likely with a rock in had. Today we have hundreds of variations of hammers available on the market. This post focuses on the typical claw hammer and how to select the best one on the market for your needs. In this post I will review what features are important in a hammer and explain how you can use product specifications to determine your favorite hammer. The weight of the hammer literally refers to what it weighs on the scale. The weight of a hammer is its most important feature of a hammer. It is important you choose the weight which fits your needs the best. Hammers under 16 ounces are designed for smaller tasks and smaller users. If you are constantly working with small materials you should look into hammers under 16 ounces. Otherwise, you should look hammers under 16 ounces only if you do not feel comfortable handling a hammer weighing more than one pound. Hammers between 16 and 20 ounces are the ideal range for light to medium claw hammer duty. 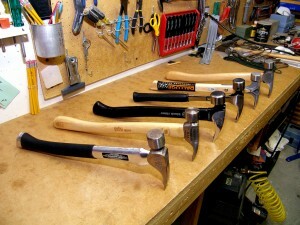 Choose 20 ounce if you feel comfortable with a heavier hammer; lean towards 16 ounces if you prefer a lighter hammer. Claw hammers over 20 ounces are great for heavy duty like an 8 hour session of framing. The heavier weight lessens the strain on the arm over a long day. However, you must be comfortable with such a heavier weight or you risk injury. Common claw hammer lengths range from 12 inches to 20 inches. The common length for the typical user is 16 inches. Stick with 16 to 20 inches when choosing a hammer for versatile use. Smaller lengths are good for tight fits or smaller hands. Hammers longer than 20 inches are usually designed for specialized tasks. Your choices are wood, fiberglass, or metal construction for a hammer handle. If you can handle the reverb I suggest a metal hammer wrapped in a good grip over any other type. Metal claw hammers can last a lifetime and are very reliable when it comes to pulling out even the hardest set nails. The Estwing Straight Claw Hammer is one of the most popular hammers for professionals because of its strength, durability, and comfort. The straight claw of the hammer gives the user more flexibility in their angle for prying. The leather grip provides durable comfort to combat the reverberation caused by metal hammers. The Estwing Straight Claw Hammer comes in 16 and 20 ounce variations. Both variations are available at an affordable price. The Pittsburgh Professional 20oz Steel Hammer offers the most features per dollar of any hammer on the market. Steel construction, oil-resistant grips, and a flat style claw combine to create a great tool for its price. The hammer face is a milled style. The metal is milled to a create a face which grips the target and reduces deflections and sparking. Milled hammer faces are great for most projects, but are not recommended for small and decorative nails. 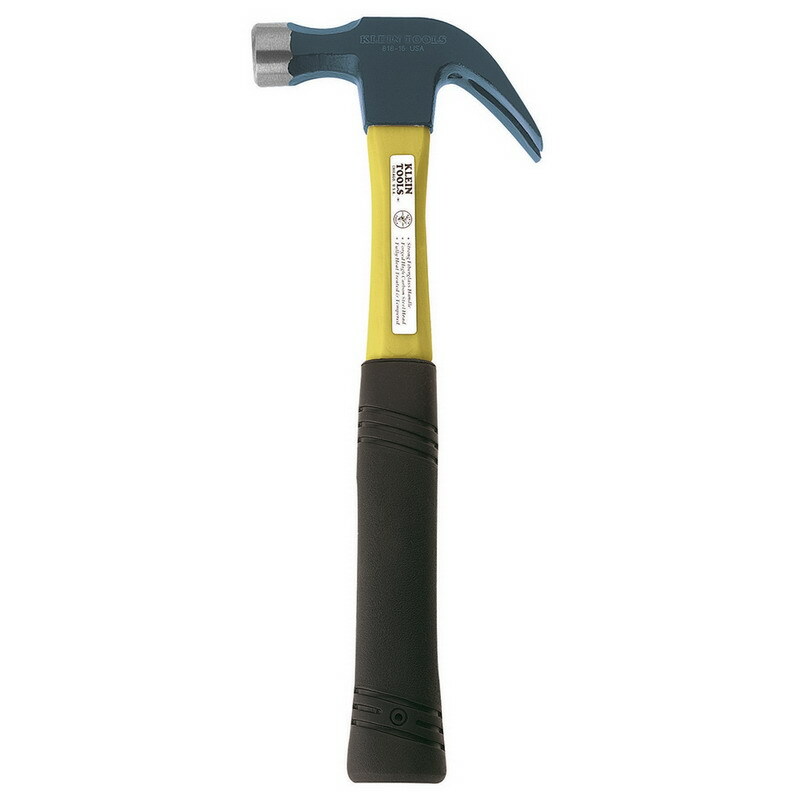 If you want reliability on a budget choose the Pittsburgh Professional 20oz Steel Hammer. The Klein Heavy-Duty Claw Hammer offers traditional hammer styling and ergonomics and quality construction. If you prefer a fiberglass handle this hammer may be the best option for you. The jacketed fiberglass handle protects you from splinters and fraying that can happen when fiberglass handles fail. The jacketing on the handle both prevents damage to the handle and protects your from the any damage. The neoprene grip of the Klein Heavy-Duty Claw Hammer provides a high level of comfort. The tempered steel striking point is a durable and traditional feature. Posted by Scotty Burrell. This entry was posted in Hammers. Bookmark the permalink.